Alcudia. With a lot of optimism, Andreas Raelert will start into the Thomas Cook Ironman 70.3 Mallorca on Saturday. "I am looking forward to the race in Alcudia", the 36-year old says looking ahead to the race, "I would like to keep the title in our family." In 2011, Andreas had won the first edition of the race in Alcudia himself, last year his brother Michael celebrated the victory on Mallorca. "Michael starts this time in the Thomas Cook VIP relay team and allows me to race in the individual event", Andreas Raelert says, "I absolutely race also for him." The World record holder on the Ironman distance comes directly from a training camp in the U.S. to the Balearic islands. More than five weeks, Andreas and Michael Raelert have prepared together in Boulder, Colorado, for the season. "Boulder offers very good conditions with its high altitude and its various training locations", Andreas Raelert says. He achieved a very successful result in his first seasonal race: Three weeks ago, Andreas Raelert won the Ochsner Ironman 70.3 New Orleans. "This race was a first real test of my fitness during the high altitude training", Andreas Raelert looks back. On Saturday, there are outstanding competitors waiting for him at the starting line in Alcudia. "The start of the European season is staffed brilliantly", the winner of 2011’s race says. Nearly 60 pro athletes are on the starting list. There is not only Andreas Raelert’s long-time team mate and 2007 olympic distance World Champion Daniel Unger taking part. Also in the race is the Spanish world-class long-distance athlete Eneko Llanos, who recently won the Ironman Melbourne. Likewise, the two extraordinary strong runners Bart Aernouts (Belgium) and Tom Lowe from the UK are among the favorites. The two fast Frenchman Bertrand Billard and Stephane Poulat and for example 2012’s second placed Michael Göhner from Germany make this pro field a world-class field. "The beautiful and challenging course and this excellent pro field make the competition very attractive", says Andreas Raelert. Michael Raelert will also start at the Thomas Cook Ironman 70.3 Mallorca on Saturday – as a swimmer in the Thomas Cook VIP relay team. 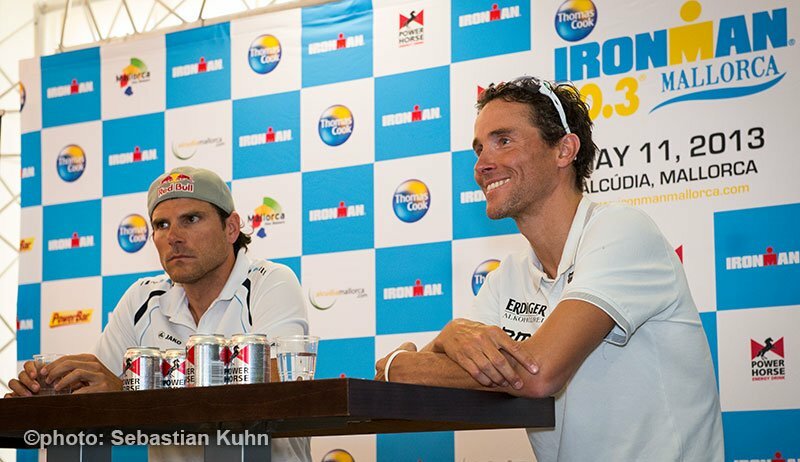 "We have a good team", the two-time Ironman 70.3 World Champion says. Michael Raelert will take over the swimming part of 1.9 kilometers in the Bay of Alcudia, before Sebastian Grahl from Thomas Cook is heading out on the 90-kilometer bike course. The former Olympic Silver medalist Frank Busemann will successfully cross the finish line for the team as a runner after 21.1 kilometers. On Thursday before the race, there is the opportunity for everybody to meet the Raelert-Brothers live in Alcudia. Michael and Andreas Raelert will be in the Raelert-Brothers-Lounge from 4 p.m. (CET) to 4.45 p.m. (CET) at the Ironman expo. In addition to tips for the race, they will give a lot of informations about current projects for children in need together with their global partner Help-for-Hope.